Our certified Sports Therapist designs rehabilitation programmes specifically for those recovering from injury. The injury’s severity will determine the length and structure of rehabilitation. We work with Cosgrove's Physio or qualified physiotherapist to supervise the process to optimise structural health and to prevent re-injury. Do I need injury rehabilitation? Have you experienced a recent injury? Do you suffer reoccurring injuries? Do you wish to return to a specific sport or activity? Epic Rehabilitation will assess and identify the problem; design the appropriate programme or advise suitable treatment, reducing the risk of reoccurrence. Warm up before main exercise with mobility and pulse raising, eliciting improved circulation and preparing the intended muscles for exercise. Increase intensity or distance by no more than 10% a week, allowing the body to safely adapt. Avoid overtraining syndrome which can lead to injury and lowered immunity by allowing sufficient recovery and sleep. Our body tells us when to stop exercising; we often choose not to listen. When pain does not reduce or disappear within 2 minutes, stop to reduce the severity of the injury. Those with a cold, fever or illness should rest until well (cardiovascular exercise best avoided). A weakened condition will reduce concentration, increasing the risk of injury and prolong illness. Ensure complete rehabilitation of an old injury to prevent reoccurrence and avoid referred injuries due to compensation. Commence normal exercise at around 10% less intensity than before injury and progress. Beware of repetitive strain injuries caused by repeatedly working the same muscles excessively... The healing process is slow. The environment should be suitable for the training: correct exercise technique, fully functioning equipment, suitable clothing and correct temperature. Sufficient cool down to lower heart rate, reduce body temperature and prevent blood pooling. 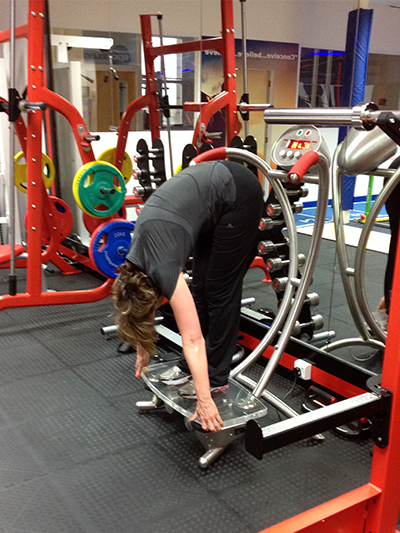 Appropriate stretching to ensure muscles and tendons return to their original length or better. Those with chronic medical conditions should consult their GP before commencing an exercise regime.